Visit any large metropolitan city around the globe and you’ve likely encountered “graffiti” or what may now be deemed street art. By definition, street art is any art developed in public spaces, although the reference usually means art of an illicit nature versus work sanctioned by local government or community art projects. It is often considered the cousin of graffiti, but typically lacks that malicious vandalism aspect associated with traditional graffiti. Street art’s origins date back to the 1960’s with slogans of protest were painted onto public walls. These statements were considered the precursor to the modern day street art. How does street art differ from graffiti? Graffiti artists typically stick to aerosol paints whereas street artists showcase their works with various materials and/or mediums. Look for mosaic tiles, street sculptures and installations, wheatpasting, woodblocking, murals, stencil and sticker art, and more. The topic of street art is still widely contested. Some consider it art while others label it a crime. Many artists have turned their passion into commissioned works for commercial buildings and community areas. Whether or not you support street art, most will agree there are some impressive displays worth checking out. Here’s a look at some of the coolest street art around the globe. In an example of local governments embracing street art is the Flemish town of Ghent in Belgium. In an effort to control illegal graffiti around town, the city designated an alleyway in the 1990s as a graffiti-zone, inviting artists to use that space instead of buildings around town. Amazingly, it worked and today Graffiti Alley (Werregarenstraat) is an artistic masterpiece and a tourist destination in its own right. Not surprisingly, Los Angeles is a mecca for street artists. Installations can be seen all over the sprawling suburbs. 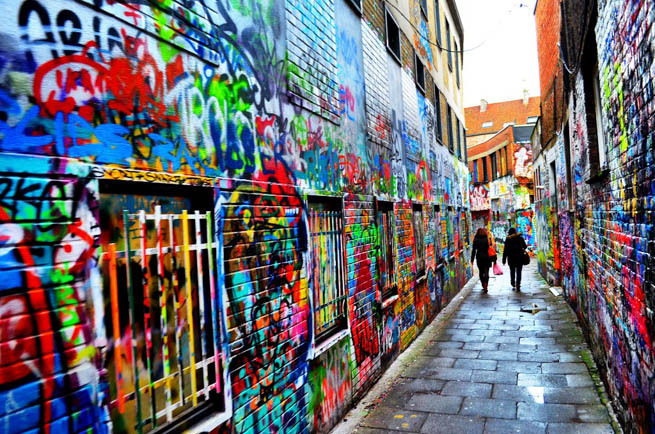 The city is home to the largest art gallery in the nation dedicated to street art. LAB ART on La Brea Avenue has 6,500 square feet of space showcasing some of the best local artists. If you are visiting the Emilia Romagna region in Italy, be sure to check out the “1000 Shadows” project in Parma. This creepy installment is the brainchild of street artist Herbert Baglione and is part of a series depicting floating silhouettes on floors and walls. The setting for his Parma installation? An abandoned psychiatric hospital. Chinese born artist DALeast has the most distinctive technique of 3D art that can be seen in numerous places around the globe. His signature style of twisted metal animals in a human world is unmistakable. Two of DALeast’s impressive works are located in Stavanger, Norway, a very popular locale for street art. While Pez’s work can be seen in numerous places around the globe, the largest concentration of pieces are in Barcelona. He started painting back in 1999 and the word “Pez” is Spanish for fish. Pez’s signature mark? A fish character with a large smile. Pez is the founder of what he calls “the happy style” and has gained such a following he now sells licensed products like backpacks and stuffed toys. Polish artist NeSpoon offers some of the most intricate street art designs around. It’s the most unexpected theme, utilizing patterns found in traditional Polish lace. She uses materials like paint, yarn and cement to recreate the intricate lace designs. Look for NeSpoon’s displays throughout Warsaw, including in the Central Railway Station. New York City street artist Kelly Goeller created the striking Pixel Pour 2.0 installation, which is located on Mercer Street in New York City. The piece features a large faucet with a pixelated stream of water coming down and stuck in mid-spill. It is a follow up to a similar piece she did in 2008 and is an interesting reminder of our continually evolving digital world. Have you seen any street art that you thought was remarkable? Erin is a travel and food writer who currently splits her time between the Netherlands and Belize. She’s traveled to 60+ countries on 5 continents with a passion for culinary travel, luxury hotels, and all things Disney. Her writing has appeared in numerous online outlets including Gadling, BootsnAll, CNN, Art of Backpacking, TravBuddy, CBS, and more. She was the major author of Belize’s official visitor magazine, Destination Belize 2013; wrote the official AFAR Guide to Belize; and is also AFAR Magazine’s local Belize expert. in the greater Los Angeles area.